These 49x90cm hand sized towels are soft cotton 500gsm. Personalised with your choice of embroidered text such as Mr and Mrs, names or initials monogrammed on each. Personalised with your choice of embroidered text such as Mr and Mrs, names or initials monogrammed on each. Your choice of embroidery font style and thread colour. 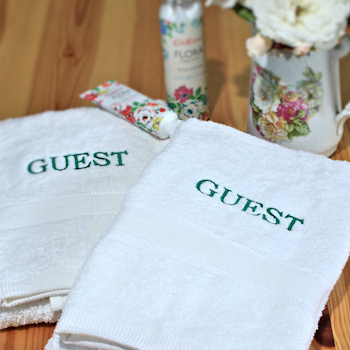 Personalised Towels are custom embroidered to order. A popular gift for weddings, anniversaries and Christmas.